The 2016 Biology Compendium from HudsonAlpha on Vimeo. The Alabama Course of Study: Science, adopted in the fall of 2015, requires substantial shifts in how science is taught across the state. 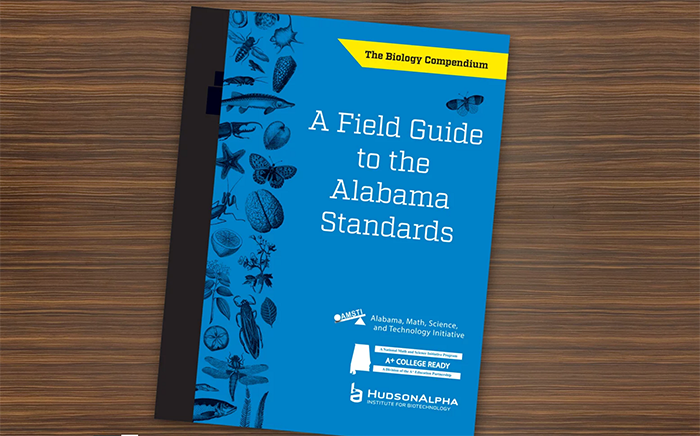 In order to assist with this shift in Biology classrooms, HudsonAlpha partnered with A+ College Ready and Alabama Mathematics, Science and Technology Initiative to develop a Biology Compendium. Through funding from the Boeing Company, a team of 10 exemplary teachers from across the state worked during 2015 through 2016 to evaluate resources for alignment to the new standards and plan best practices for their deployment in classrooms. Much richer than an aligned resource list, the Compendium serves as a “field guide” to the standards assisting biology educators through the somewhat unfamiliar landscape (the new course of study), recommends itineraries that highlight relevant points of interest (suggests ways to sequence activities), and explains their significance within the broader culture (highlighting how the practices and connecting concepts enrich student sense-making). The Biology Compendium will be distributed to Alabama High School Biology Teachers in the fall of 2016. The Compendium will be disseminated to educators by all three partner organizations. HudsonAlpha will highlight it at the GREAT: Standards workshops during the 2016/17 school year.